The number of passengers using inflight connectivity on Oman Air’s OnAir-equipped Airbus A330s has increased dramatically in the past year, as has the volume of data exchanged. The airline has seven A330s fitted with both Mobile OnAir and Internet OnAir.From 2012 to 2013, the number of Oman Air’s passengers logging on to the OnAir networks increased by 45%, and 85% more data was used. Oman Air has worked on increasing usage by implementing a series of creative new marketing initiatives. These have included a promotion allowing passengers to use Frequent Flyer miles to purchase Wi-Fi codes, as well as offering free vouchers to First and Business class passengers in three or four different periods throughout the year. The airline has also included a promotional advertising campaign and a clip about Mobile OnAir before every film. 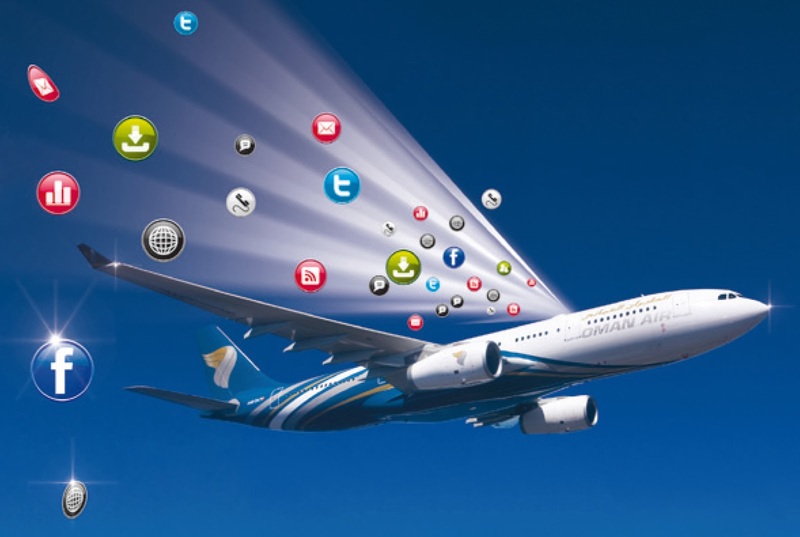 OnAir predicts that Oman Air will see a doubling of Wi-Fi usage in 2014, thanks to its innovative approach to marketing and providing passengers with value-added services around connectivity. The usage figures show that when passengers know about the service, there is a great demand for it. It also shows that OnAir connectivity can meet both customer expectations and increasing demand. Oman Air has opted for OnAir because it is the only provider offering consistent global coverage. OnAir has a unique network of regulatory authorizations from over 100 countries and more than 350 roaming agreements with mobile network operators. These are complemented by Inmarsat SwiftBroadband, the only satellite network specifically designed to provide worldwide coverage. Oman Air also has codeshare partnerships with Emirates Airlines, giving travellers better connectivity and an extended range of services between Dubai and Muscat, as well as with Qatar Airways allowing Oman Air’s customers to book flights from any of the 43 departure points within its network to Doha, the capital of Qatar. Earlier this year, Oman Air, entered into a codeshare partnership with Ethiopian Airlines, the national carrier of Ethiopia, on the Muscat and Addis Ababa sectors, which will offer greater choice for customers of the two airlines. In addition, codeshare agreements have recently been signed with Royal Jordanian and Turkish Airlines. The Royal Jordanian agreement enables that airline’s customers to fly with Oman Air between Muscat and Amman, and Oman Air’s customers to fly with Royal Jordanian between Amman and Beirut. The agreement with Turkish Airlines allows passengers to book with either airline to fly between Muscat and Istanbul, with the flights being operated by Turkish Airlines. Oman Air also has signed a codeshare agreement with Sri Lankan Airlines recently, which offers even greater choice and convenience for customers of both airlines. The agreement, allows Oman Air’s customers to book seats on SriLankan Airline’s services from Muscat to Singapore, Male, and China via Colombo. In turn, Sri Lankan Airlines’ customers will be able to book onto Oman Air’s flights from Colombo to Zurich via Omani Capital Muscat. Oman Air’s fleet currently consists of four Airbus A330-200s, three Airbus A330-300s, 17 Boeing 737-700s/800s, four Embraer E175s and two ATR 42s. Six Boeing 787 Dreamliners are on order for delivery from 2015, three Airbus A330s are expected from December 2014 and six Boeing 737-800s will be added to the fleet, also from 2014. In addition, Oman Air announced at the Paris Air Show 2013 an order for six Boeing 737-900ERs – the first Gulf carrier to take the aircraft. By 2016, Oman Air’s total fleet size is expected to be around 50 aircraft. Oman Air’s outstanding aircraft interiors include its First Class Mini Suite, which provides each of the six First Class passengers with direct aisle access and converts to the longest lie-flat seat in the skies. The A330’s 20 award-winning Business Class seats each provide direct aisle access, ample storage space and the latest technological amenities. Economy Class seats offer adjustable head and leg rests, together with generous leg and elbow room. A state of the art in-flight entertainment system features individual seatback screens, audio and video on demand and live satellite TV. In addition, Oman Air has pioneered both mobile telephony and Internet connectivity on board its flights and this is available in all three classes. Oman Air’s commitment to quality, comfort and a seamless passenger experience has resulted in international acclaim, including: Best Business Class Seat in the World (Skytrax World Airline Awards 2011, 2012); Service Excellence, Middle East (Skytrax World Airline Awards 2011); Best Luxury Airline, Middle East (Business Destinations Awards 2011, 2012, 2013); Technological Innovation of the Year (Aviation Business Awards 2010); as well as recognition in the TravelPlus Amenity Bag Awards 2010 (three Gold, one Silver), 2011 (two Gold, one bronze), 2012 (one Gold); the Cellars in the Sky Awards 2010 (Silver) and 2012 (two Gold), the KLIA Awards 2011, the 2009 Vision Awards (one Silver, one Bronze) and the Travel Industry Club Awards 2010 (Silver), TTG Travel Award 2011 as Commended Airline of the Year, Best In-flight Connectivity & Communications award in The 2011 Passenger Choice Awards in Seattle USA, The Airline of the Year Award at France's Lauriers d'Or du Voyage d'Affaires, Top Resa 2011. More recently, Oman Air was named the Leading Economy Class Airline, Middle East at the World Travel Awards 2013. OnAir sets the benchmark for global inflight connectivity solutions, with over 60 customers on five continents. We are the only provider to offer consistent global coverage for both inflight cellular and Wi-Fi services, thanks to regulatory approvals from over 100 countries, more than 350 roaming agreements. OnAir’s products enable passengers to use their own mobile phones, smartphones, tablets and laptops in exactly the same way as they do on the ground, either through the onboard cellular network or the onboard Wi-Fi hotspot. OnAir also provides on-demand entertainment content, such as music, videos, newspapers and magazines. The products are available as linefit or retrofit for all commercial aircraft, as well as government, VIP and business jets. OnAir products operate over all satellite links. OnAir was incorporated in February 2005 and is owned by SITA, the leading IT solutions provider to the air transport world. OnAir is a member of the GSM Association and an Inmarsat Distribution Partner for both SBB and GX Aviation services.